This text and analysis draws extensively from (Zipperer 2016), a working paper published by the Washington Center for Equitable Growth. The Fair Minimum Wage Act of 2007 increased the federal minimum wage over three years, from $5.15 per hour to $7.25 per hour in 2009. Many states also have minimum wage laws and the higher of the state or federal minimum wage level applies. To assess the effects of the 2007–2009 federal minimum wage increase, Clemens and Wither use this variation in effective minimum wage laws by comparing the employment changes of low-wage workers in what they call “bound” and “unbound” states. Bound states, such as Georgia, had relatively low minimum wages and were therefore bound by the federal minimum wage increase to enforce a higher minimum wage for their workforce. Conversely, unbound states had higher minimum wages than the federal level, and therefore the increase in the federal standard provided only a small (or even no) boost to the statutory minimum in those states. Hence the 2007–2009 increase in the federal minimum substantially raised the effective minimum wage in bound states but did not increase, or increased only slightly, the effective minimum wage in unbound states. By comparing the employment rates of groups of workers in bound and unbound states, and before and after the federal minimum wage increase, the authors use what is typically called a “difference-in-differences” research design (Kuehn 2014). As shown below, this research design biases the authors’ results because bound and unbound states were not comparable prior to the federal minimum wage increase and experienced different employment shocks during the Great Recession. Clemens and Wither primarily study three groups of workers likely affected by the federal minimum wage increases of 2007 to 2009. For the main part of their analysis, they use data from the U.S. Census Bureau’s Survey of Income and Program Participation (SIPP) to follow a group of low-wage workers who earned less than $7.50 per hour between August 2008, the beginning of their low-wage sample, and July 2009, when the minimum wage rose from $6.55 to $7.25 per hour. The authors expand their analysis to follow two other groups of workers from 2006 to 2012, using data from the Current Population Survey (CPS): individuals between the ages of 16 and 21, and individuals between the ages of 16 and 30 who lack a high school diploma. Table 1, column 1 presents, for each of the three groups, the authors’ baseline estimates of the change in the employment rate (the percentage of the population that is employed). Across all of these groups, workers in bound states (states with substantial increases in the effective minimum wage) experienced economically large and statistically significant declines in the employment rate relative to workers in unbound states (with little or no increase). Column 2 presents my close replication of their findings. Here the estimated effects range from a 2.3 percentage-point decline in the employment rate of individuals ages 16-21 to a 5.9 percentage-point decline for low-wage workers. Notes: The table reports the coefficient on the Period 2 X Bound term from the baseline regressions in Clemens and Wither (2016); see Zipperer (2016) for a complete discussion. Column 1 contains the Clemens and Wither’s published results, column 2 is this author’s replication, and the remaining columns include additional control sets. Columns 2 through 6 use monthly sampling weights. Industries are state-specific NAICS (North American Industry Classification System) supersector shares of total private-sector employment, where these shares are interacted with time fixed effects. Although Clemens and Wither argue that the minimum wage increase caused these employment declines, this interpretation is correct only if bound and unbound states were comparable prior to the minimum wage increase and experienced the same kinds of employment shocks due to the Great Recession. The following analysis assesses this assumption of comparability between bound and unbound states across a number of dimensions in a series of robustness tests. This assumption largely fails, and renders the Clemens and Wither results invalid. The first robustness test accounts for the fact that states with a large increase in the effective minimum wage had a different industrial structure than states with little or no effective increase. Specifically, bound states were significantly more likely than unbound states to have larger shares of construction employment in 2005 and 2006, prior to the federal minimum wage increase. As a result, bound states were more exposed to the collapse of the housing bubble and accordingly experienced sharp employment declines that were correlated with but not caused by the federal minimum wage increases. 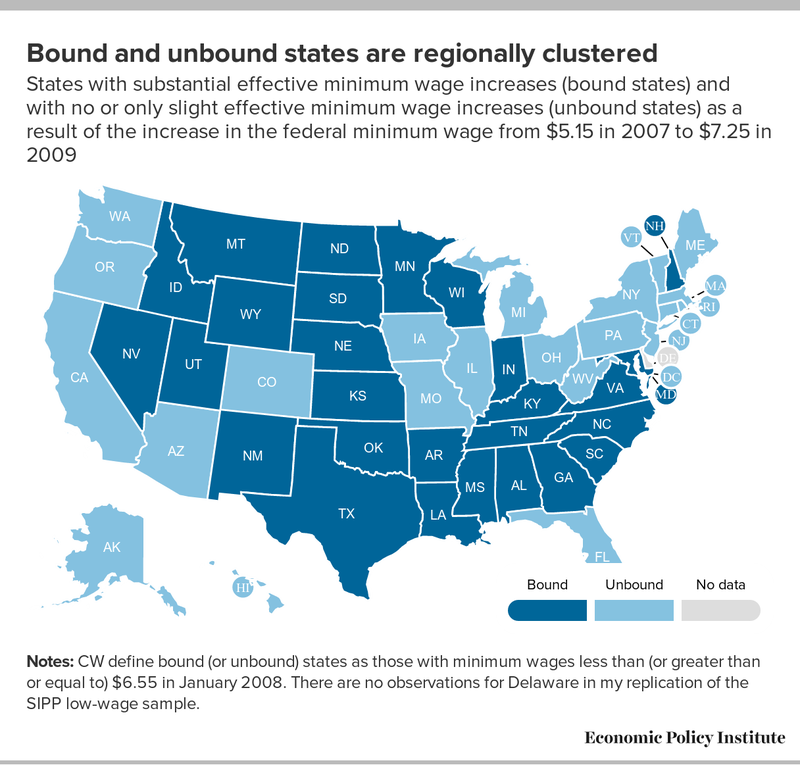 Notes: CW define bound (or unbound) states as those with minimum wages less than (or greater than or equal to) $6.55 in January 2008. There are no observations for Delaware in my replication of the SIPP low-wage sample. In Table 1, columns 3 and 4 show directly that failing to control for these sectoral differences negatively biases the estimates reported by Clemens and Wither. To disentangle the employment effects of the minimum wage increase from the effects of having a different industrial structure, column 3 repeats the same analysis as Clemens and Wither but also includes controls for construction’s share of each state’s employment in 2005–2006. These construction share controls consistently reduce the size of the baseline-estimated decrease in employment. The estimated decline in low-wage employment shrinks by 35.6 percent, from -0.059 to -0.038. For the two groups of younger workers, construction share controls reduce the estimated employment decline by 43.2 and 65.2 percent. Column 4 includes controls for all private-sector industry shares, not just construction, and these industry controls further shrink the employment effects estimated by the authors. After including all industrial shares as controls, none of the estimated declines in the employment rate are statistically significant. States with significant increases in the effective minimum wage did not have the same industrial structure as states with minimal or no increases after to the federal minimum wage increase, and controlling for these sectoral differences essentially eliminates the large, significant declines in employment that Clemens and Wither incorrectly attribute to the federal minimum wage increase. Industry controls may not capture all of the differences between employment trajectories for bound and unbound states. Indeed, the map in Figure A shows that bound and unbound states are geographically concentrated. Bound states, with lower state minimum wages (and thus more affected by the federal minimum wage increase), are prevalent in the South and Mountain regions, whereas most unbound states, with higher state minimum wages, are in the Northeast and on the Pacific Coast. Instead of being uniformly distributed throughout the U.S., the regional pattern of bound states will risk conflating the regional shocks of the Great Recession with minimum wage increases. It is therefore necessary to include geographic controls for employment differences between bound and unbound states, as is common in research on minimum wages (see for example Meer and West 2016). Each state resides in one of four Census regions or one of nine Census divisions. Whereas models (1) through (4) in Table 1 control for common, national shocks to employment in any month by including controls for common time fixed effects, models (5) and (6) incorporate controls for Census region-specific and Census division-specific employment shocks by including region-specific and division-specific time fixed effects. These controls account for employment declines common to all states within a given Census region or division, an important consideration during the Great Recession when certain areas of the country experienced sharper downturns. 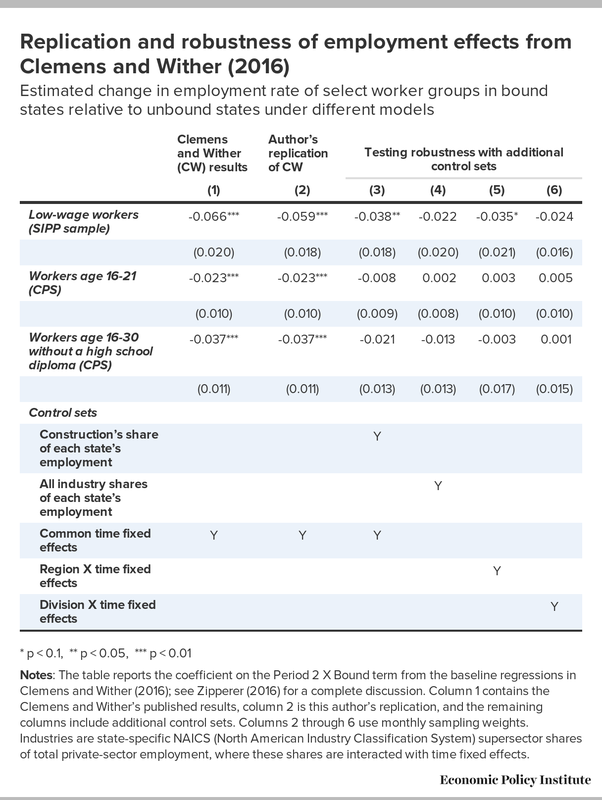 Table 1 validates the concern that bound states experienced larger employment declines than unbound states simply due to the regional shocks of the Great Recession, because including these geographic controls significantly reduces the size of the estimated employment effects. For the low-wage worker sample, column 6 shows that division-specific time fixed effects shrink the baseline employment effect from -0.059 to -0.024, a decline of 59.3 percent, an estimate which is no longer statistically different from zero at conventional levels of significance. The attenuation is more dramatic for the groups of younger individuals in the CPS data samples. For these groups, division-based controls reduce the baseline employment effect to estimates very close to zero. A geographic “placebo” test directly demonstrates that the authors’ baseline estimates are negatively biased. For this test, the sample is limited to the unbound states, which are those that did not substantially increase their minimum wage over the sample period because they already had minimum wages higher than the federal standard. Each unbound state that is within a Census division in which a majority of the population lives in bound states is assigned a hypothetical placebo increase in the minimum wage. In essence, this test focuses on the unbound states (say, Arizona and Colorado) that did not face an effective increase in their minimum wage but just happened to be located in a Census division (say, the Mountain division) in which most states did, and compares their employment paths to unbound states in divisions where most states did not experience effective minimum wage increases. Since none of the states in the placebo test actually increased their minimum wage significantly—the placebo exercise sample only includes actually unbound states—estimating employment effects of the placebo-based minimum wage increase should provide estimates close to zero. However, the employment estimates of the placebo test are significantly negative. Despite no actual increase in the effective minimum wage in these unbound states, the presence of other states with increases in their minimum wage is correlated with employment losses. This strongly suggests that the main factors that are driving the employment differences between bound and unbound states are regional employment declines of the Great Recession that are not caused by the minimum wage. In fact, Figure B shows that the placebo effects estimated using only the unbound states closely match both the size and also the timing of the employment effects estimated by Clemens and Wither using their baseline model. The figure plots the employment effects of the SIPP low-wage sample for the baseline model using all states (dark blue) and for the placebo-based model using unbound states (light blue). Around the time of the July 2009 federal minimum wage increase, the baseline results show that low-wage employment fell sharply in bound relative to unbound states. Yet, this is also true of the placebo sample, which saw no real minimum wage increase: unbound states in “bound” divisions also experienced a similarly sized and similarly timed employment decline. Notes: The figure reports the time-varying coefficients on the Bound term from the baseline regressions in Clemens and Wither (2016) and the Division-Bound term from the placebo falsification test, where the sample is the SIPP low-wage sample and the outcome is an individual-level employment indicator; see Zipperer (2016) for a complete discussion. 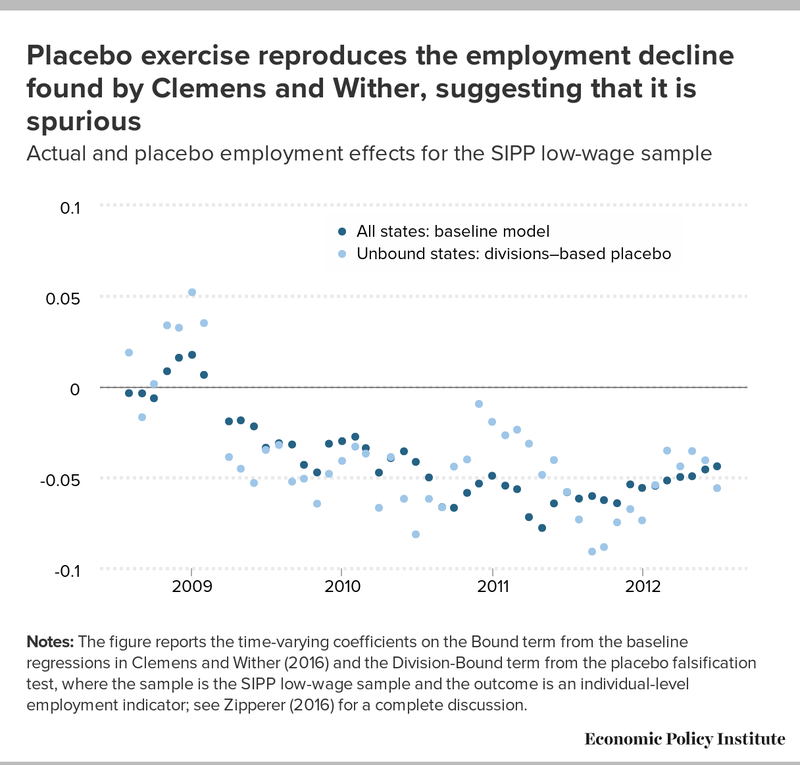 Because the placebo exercise reproduces the pattern of the employment decline, it is likely that the negative employment effects reported by Clemens and Wither are spurious. Instead of reflecting the causal effect of the minimum wage, the authors’ estimates simply fail to account for regional employment shocks of the Great Recession. The analysis in this report supports the hypothesis that the federal minimum wage increase from $5.15 in 2007–to $7.25 in 2009 did little to affect employment levels. Industrial and geographic factors account for the employment differences between states with and without significant minimum wage increases, so these employment differences were correlated with but not caused by the minimum wage. Once the appropriate controls are included, employment differences between unbound and bound states are generally small and statistically insignificant. Ben Zipperer joined the Economic Policy Institute as an economist in 2016. His areas of expertise include the minimum wage, inequality, and low-wage labor markets. Prior to joining EPI, Ben was research economist at the Washington Center for Equitable Growth. He is a senior research associate at the Center for Economic and Policy Research and a research associate at the Center on Wage and Employment Dynamics at the University of California, Berkeley. He has a Ph.D. in economics from the University of Massachusetts, Amherst. Clemens, Jeffrey, and Michael Wither. 2016. The Minimum Wage and the Great Recession: Evidence of Effects on the Employment and Income Trajectories of Low-Skilled Workers. University of California at San Diego. Kuehn, Daniel. 2014. The Importance of Study Design in the Minimum-Wage Debate. Economic Policy Institute. Meer, Jonathan, and Jeremy West. 2016. “Effects of the Minimum Wage on Employment Dynamics.” Journal of Human Resources, vol. 51, no. 2, 500–522. Zipperer, Ben. 2016. Did the Minimum Wage or the Great Recession Reduce Low-wage Employment? Comments on Clemens and Wither. Washington Center for Equitable Growth.